A state funeral is under way in Romania for its former monarch, King Michael, who died aged 96 on 5 December. More than 20,000 Romanians queued in the capital Bucharest to pay their respects to his body, lying in state. Royalty from across Europe are attending, including Spain's former King, Juan Carlos, and Prince Charles. King Michael is best remembered for the coup he joined in August 1944 to switch Romania from the Nazi to the Allied side in World War II. Forced to abdicate by Romania's communist leaders a few years later he lived most of his life in exile in Switzerland. After the Romanian revolution in 1989, he had a difficult relationship with the country's new rulers, who were afraid he would reclaim his throne. Instead, he helped negotiate Romania's membership of the EU and Nato. As soldiers carried his coffin on Saturday, a clutch of foreign royals looked on, also including Spain's former Queen Sofia, King Carl Gustaf of Sweden and his wife Queen Silvia, Greece's former Queen Anne-Marie, Henri, Duke of Luxembourg, and Belgium's Princess Astrid and her husband Prince Lorenz. His coffin is to be carried on the railway line his grandfather, Carol I, built from Bucharest to the royal necropolis at Curtea de Arges, north of the capital. For most of the war, King Michael was largely a figurehead, scorned by Romania's fascist dictator, Ion Antonescu, during the four-year alliance with Hitler. However, at the age of 22, he took part in the coup, ordering Antonescu's arrest on 23 August 1944. After the Nazis' defeat by the Soviet army, communists took power in Romania and at the end of 1947, he was forced to abdicate. He did not go back until 1990, after the fall of communist dictator Nicolae Ceausescu. For Romanians, he was an important player throughout some of the most difficult times in their history: at heart a decent man and a democrat in an age dominated by totalitarian regimes, Romanian journalist Petru Clej writes. I wonder how many Romanians want to restore their monarchy. @Neon Knight wrote: I wonder how many Romanians want to restore their monarchy. IMO not so many of them. Screw this guy. He sold Romania out to the commies and fled to Switzerland. Do you think that is because they are scared of another dictator ruling them? No, I just think they aren't interested in monarchy and they want to live in a republic. Their king belongs to the past. The Romanian parliament has now initiated a process in which they will consider holding a referendum on re-introducing a constitutional monarch as the country’s new form of government. This was reported earlier this week by Romanian Insider. It is the two leaders of the current Romanian government who have initiated the process. They are Niculae Bădălău, the executive president of the Social Democrat Party and Călin Popescu-Tăriceanu from the Alliance of Liberals and Democrats. 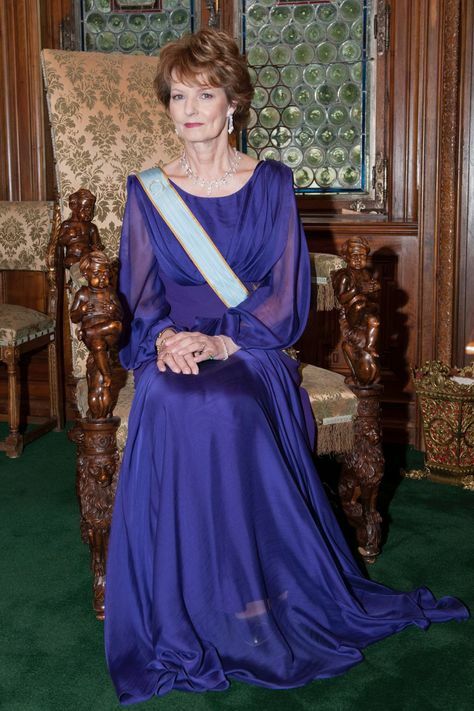 Crown Princess Margareta of Romania, Custodian of the Crown of Romania and former Princess of Hohenzollern (born 26 March 1949) is the eldest daughter of King Michael I of Romania (1921–2017) and Queen Anne (1923–2016). Princess Margareta's father named her the heir presumptive to Romania's abolished throne in 1997. She assumed her father's duties in March 2016, upon his retirement, and has claimed the headship of the House of Romania since the death of her father on 5 December 2017. Margareta has four sisters and no brothers or children. Her heir is her next sister, Princess Elena of Romania. According to the defunct last democratic royal Constitution of 1923 which barred women from wearing the crown, Margareta and her sisters could not succeed to the throne of Romania. On 30 December 2007, King Michael designated Princess Margareta as heir presumptive to the throne by an act which is not recognized by the Romanian Republic and lacks legal validity without approval by Romania's Parliament. On the same occasion, Michael also requested that, should the Romanian Parliament consider restoring the monarchy, the Salic law of succession not be reinstated, allowing female succession. According to the new statute of the Romanian Royal House as declared by Michael, no illegitimate descendants or collateral lines may claim dynastic privileges, titles or rank and any such are excluded from the Royal House of Romania and from the line of succession to the throne. I’ve read about this, but the referendum would be unconstitutional. Romanian Constitution forbid any change of republican form of government. They have to change their constitution, too. I didn’t find English source, sorry, just Hungarian. Magyar Lány wrote: I’ve read about this, but the referendum would be unconstitutional. Romanian Constitution forbid any change of republican form of government. They have to change their constitution, too. This is why I have a lot of doubt when people say the UK should have a written constitution. A constitution makes it harder and slower to make important changes. And I can't think of any advantages. A total of 46% of the Romanians believe that the local monarchy was a positive thing, according to a recent survey performed by Avangarde, and quoted by the public television TVR. At the same time, 30% believe the opposite, and the rest did not express an opinion. Romania officially became a constitutional monarchy in 1881, when Carol I was crowned king. He had been ruling the country since 1866. The monarchy ended in 1947, when King Michael I was forced to abdicate. The survey was conducted over the phone between December 26 and January 7. A total of 710 people were surveyed. The maximum tolerated error is of plus, minus 3.8%. The same survey showed 37% of those questioned believed that a referendum about returning to a monarchy form of government would be needed. While 46% said such a referendum is not needed, 16% said they could not asses if the referendum would be necessary. The survey also looked at the popularity of members of Romanian Royal House and other royal figures. Princess Margareta, the Custodian of the Crown, and former prince Nicolae are ranked equally in the preferences of the Romanians. Both of them attracted the positive opinion of 41% of the respondents in the survey. However, Charles, Prince of Wales outranks them both, with 54% of the respondents declaring a positive opinion on him. The first mentions about a potential referendum about the country becoming a constitutional monarchy emerged at the end of last year, after the death of King Michael I, Romania’s last monarch. The country gave a state funeral to the late king and thousands joined the funeral ceremonies in Bucharest, alongside representatives of many European and international royal houses, including Prince Charles of Wales, former King Juan Carlos and Queen Sofia of Spain. Millions more watched the funeral on TV. People also queued to pay their respects while the king’s casket lay at the former Royal Palace in Bucharest, throughout the national mourning days. A draft bill concerning the status of the Romanian Royal House as an autonomous public utility legal entity is currently under debate. Prince Charles has long been popular in Romania because of his contribution to supporting and promoting Romania’s natural and cultural patrimony. The prince owns several properties in Romania, including in the Viscri village in Brasov county. The village has received an increasing number of tourists since the prince has started vacationing there.